Ecologist Daniel Ahern's fieldwork supports a project that was funded through the Boffa Miskell Research Programme. 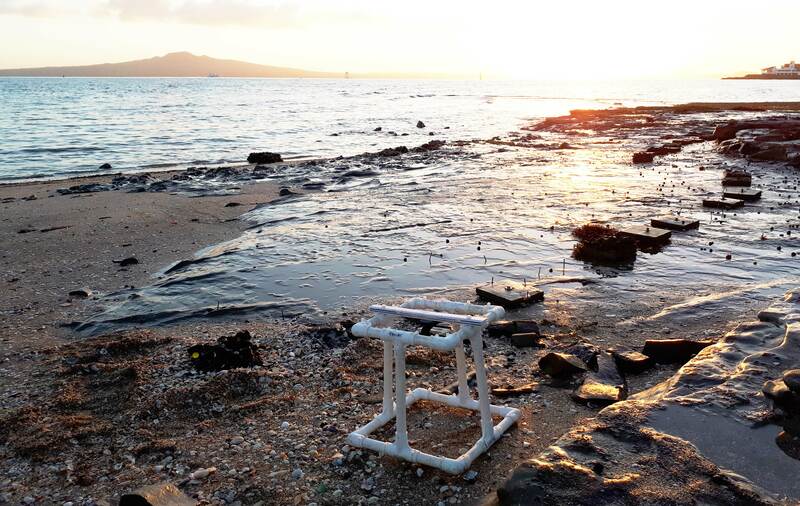 The objective is to provide robust quantitative data in order to determine if certain coastal protection structures, or methods of construction, provide better ecological outcomes than others. Coastal protection structures (such as rock revetments and seawalls) are built to protect land from erosion and the effects of sea level rise. Ecological effects assessments are a key part of the consenting process to safeguard against, and minimise, adverse effects from these structural interventions. Marine ecologists at Boffa Miskell are often called upon to undertake such assessments. These can include negative impacts on the marine environment such as smothering existing soft sediment habitats or breaking marine-terrestrial connectivity. Conversely, these structures can also have positive effects by providing space for hard shore species to colonise. However, few long-term studies have been undertaken of these potential positive ecological outcomes in New Zealand. This makes carrying out balanced effects assessments on these structures difficult. In 2016, Boffa Miskell research funding was awarded to Dr Jacqui Bell to pursue research into ecologically effective coastal protection. The first stage of this project is currently being pursued as a master’s thesis by ecologist Daniel Ahern, under Jacqui’s guidance. The objective of Daniel’s research has been to determine if there are coastal protection structures or methods of construction that provide better ecological outcomes. 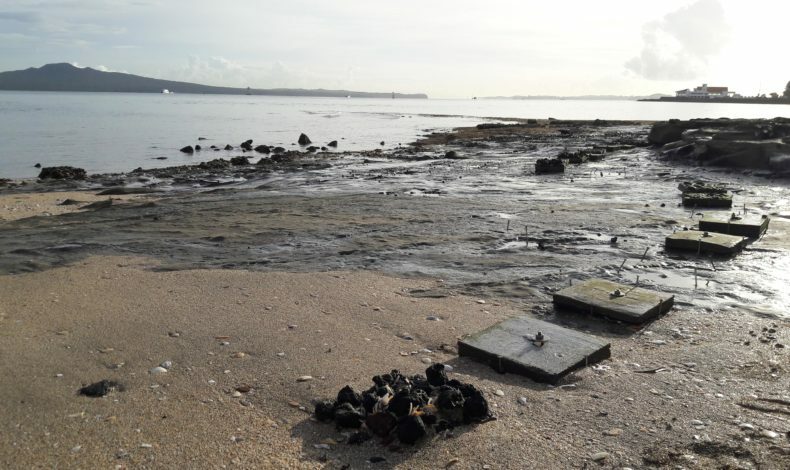 These better outcomes could be achieved by providing more crevice space for hard shore species (such as snails and limpets) to forage and hide, or by simply providing a larger surface area for a diverse range of marine species (such as seaweed, crabs, fish and birds) to colonise and inhabit. Daniel undertook ecological monitoring of a range of existing coastal protection structure types (rock revetment, masonry seawall, concrete and mudcrete seawall), at a number of sites throughout the Hauraki Gulf over a 12-month period. Daniel made and monitored project-specific tiles, designed to replicate these same structure types at a smaller scale. All sites and tiles were free of biological growth at the start of the experiment. Using a 3D quadrant and GoPro, Daniel was able to capture time-lapse data of growth and recolonization by a range of species. Analysis of collected data will allow us to compare the species that are recolonising, the rate of succession, any adverse ecological effects (such as invasion of opportunistic or non-native species), as well as positive direct and indirect effects (such as provision of food and habitat). Daniel says the most challenging aspect of the project was dealing with, and adapting to, the uncontrollable elements of fieldwork. These included environmental factors such as storm events, and human factors such as vandalism and tampering. With all necessary fieldwork and data collection requirements now complete, Daniel says he’s spending the summer in the library analysing and writing up his findings. It’s hoped that this work can form the basis for guidance on ecologically effective coastal protection, with the aim of bringing ecological considerations to the forefront of design work, alongside landscape and engineering. This research project has provided the opportunity for collaboration with Auckland University, Auckland Council and Tonkin + Taylor Ltd.
Daniel Ahern’s masters research is being carried out through Auckland University, with co-supervision from Dr Jacqui Bell and Dr Richard Taylor (Senior Lecturer, Auckland University), with peer review by Dr Sharon De Luca. Science, permits and coastal engineering advice has also been provided by Auckland Council and Tonkin + Taylor.